Twenty-five years ago, 25 years seemed like a long time. Now … not so much. Isn’t it interesting how our perception of time changes with time? The quarter-century in the rearview mirror is on our minds because June 5th will mark 25 years since we opened Lucky 32. I ramble on (and on) about that in an insert to this letter. 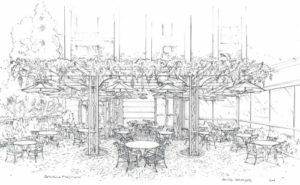 We’re also excited about some pretty neat things that we have planned for this summer, including: hosting two impressive “foodie weekends” at O.Henry, and building an extraordinary arbor in the GVG Courtyard. We are honored that you choose to receive these letters. If you don’t want to continue to get them, please just email us at qwrhinfo@qwrh.com. Or, if you wish to receive these electronically and potentially opt for more frequent communiqués that talk about special happenings, please sign up for email updates on our websites or follow us on Facebook. As usual, many contribute to these letters, but they are primarily written in first person by me, Dennis. Food fanatics — a “Southern dozen” of them — will come together at the O.Henry Hotel to celebrate the wonderful Savor the South® cookbook collection by UNC Press. The authors of these books are all deservedly well-known cooks and writers and a lively lot, so this is sure to be a fun time. 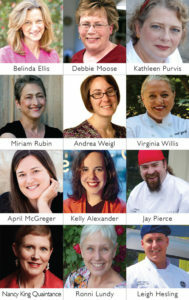 There’ll be extraordinary food and drink, mingling with the authors, cooking demonstrations and samplings of more than 30 recipes. Each day will include a four-course dinner matched with some special wines. Belinda Ellis (Biscuits), Debbie Moose (Buttermilk), Kathleen Purvis (Pecans and Bourbon), Miriam Rubin (Tomatoes), April McGreger (Sweet Potatoes), Andrea Weigl (Pickles & Preserves), Kelly Alexander (Peaches) and Virginia Willis (Okra). Joining the authors are hosts Ronni Lundy (cookbook author and great friend), Nancy King Quaintance, Chef Leigh Hesling of GVG and Chef Jay Pierce of Lucky 32 (who is in the process of writing a book about shrimp for this series). A one-night package, which includes accommodations, two tickets to Friday’s Farm-to-Fork Dinner, breakfast, Saturday’s Tasting Extravaganza Lunch and a cookbook, is $295/person, double occupancy. A two-night package, which includes accommodations, Friday dinner, Saturday lunch and Saturday night Bourbon & Bluegrass Bacchanal Dinner, is $449/person, double occupancy. See ohenryhotel.com or call 336-854-2000 for more details. Do the math. These are good deals. This is a real treat for folk who love food and Southern Living magazine: O.Henry Hotel will be one of the first stops for the Southern Living “Test Kitchen on the Road.” Vanessa McNeil Rocchio, cookbook author and test kitchen specialist, will share recipes and cooking tips, plus secrets from her 24 years at Southern Living. In addition, she’ll host a really special farm-to-fork feast. Green Valley Grill Executive Chef Leigh Hesling will join her in preparing a dinner made from fresh finds that they’ll get from the farmers market that morning! They will demonstrate the recipes that you will enjoy during a four-course dinner, which will include wine pairings. Before dinner, you can also enjoy a relaxing afternoon tea with Vanessa, during which she’ll sign her cookbook, What’s for Supper: 30-Minute Meals Everyone Will Love (included in your package). Most already know that the O.Henry was invited by the Southern Living editors to be a member of the prestigious Southern Living Hotel Collection. This association allows us to partner with the “South’s most trusted kitchen” for this, the first of many collaborative special events. Packages start at $245/person, double occupancy. But you can add extras, like a second night. Please call 336-854-2000 or go to ohenryhotel.com to learn more. Pretend that you traveled farther than you did, and let elegance and tranquility restore your spirit, plus take in the extraordinary Mediterranean flavors at Green Valley Grill. Some packages include music, art or theatre offerings. For details, please call 336-854-2000 or go to ohenryhotel.com. New Arbor: Since that first summer 15 years ago, dining al fresco at GVG has been, we’ll not-so-humbly say, pretty fantastic. When our new arbor is complete, it’ll be even better. We’ve long wanted to add a gentle breeze on cue, offer a little more shade and provide even better lighting. This arbor will make all of that happen and ought to be gentle on the eyes to boot. Our great friend, artist Jeff Hurr, is building it. Note: Give us some time! The frame will be up by the time you read this, but some of the components will be perfected and crafted, then added later. Cooking Classes: A few tickets are available for Chef Leigh Hesling’s remaining cooking classes this year. (The June 14 class is sold out.) Join him at Proximity Hotel on September 20 and O.Henry Hotel on July 12 and October 25. Tickets are $80 per guest, or get a three-class package for $225. Enjoy a seasonal beverage during a cooking demonstration, then a three-course meal with wine. For tickets, contact Lee Healy at 336-478-9126 or lhealy@qwrh.com. Afternoon Tea: Taking tea, including the wonderful savory and sweet snacks by GVG, in O.Henry’s Social Lobby has become a Greensboro tradition. In fact, it’s so popular that we’re expanding the hours. Now: Friday, Saturday & Sunday, Noon—5 PM and Monday—Thursday, 2—5 PM. Reservations are always recommended. Please call GVG at 336-854-2015. Here are two ideas for a relaxing summer vacation or “staycation”! 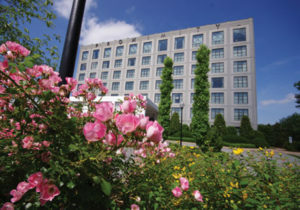 For details and more ideas, please call 336-379-8200 or visit proximityhotel.com. Mussels-Wine-Music: On Wednesday nights, we’ll continue our mussels and fries special for $15, five wines under $15 a bottle and live music as the sun sets (7—10 PM) by AM rOdeO with Evan Olson & Jessica Mashburn. Bryan Series: We are delighted to be one of the sponsors of this amazing speaker series. Our friends at Guilford College bring noteworthy figures from the arts, humanities and public affairs to town to share their wisdom and perspectives. Mark your calendars for next season (2014–2015)! October 23: Ron Howard, November 11: Bill Bryson, February 17: Robert Reich, March 24: Margaret Atwood and April 19: Anderson Cooper. Season subscriptions sell quickly, so get yours now and get a Print Works voucher! For more: bryanseries.guilford.edu. Dream Weddings: See photos, read details and learn tips from a dozen extraordinary weddings at our hotels on our photo journal blog at GreensboroDreamWeddings.com. If you know a bride-to-be, please share this with her. For more information about creating your own bespoke celebration at our hotels, please call 336-478-9111. 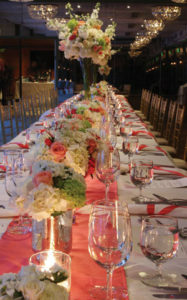 Southern Living Wedding Workshop on October 5: Who knew wedding planning could be so much fun? 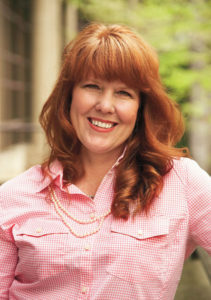 Kristen Payne, Southern Living wedding insider, will share the ideas and inspiration behind a Southern Living wedding. Taste, touch and see the latest food, drink and décor trends. Meet vendors and get plenty of tips and design ideas. $45 per guest includes afternoon tea, dessert bar, wine and goodies. For reservations, please call 336-544-9615. Recipe Contest: What’s your favorite way to prepare fresh veggies from the garden? Please enter your recipe for an appetizer or side dish into our “Summer Veggie Recipe Contest.” Think potlucks and summer picnics! The top five recipes will be featured on our blog, and the big winner will receive a luxurious retreat to the Proximity Hotel or O.Henry Hotel, along with other goodies, including recognition on Lucky’s menu. Simply email your recipe to lucky25@qwrh.com by June 16. Go to lucky32.com for more details. Farm-to-Fork Blog: Ride along as Chef Jay Pierce continues to explore Piedmont foodways with features on farms, seasonal finds and recipes. 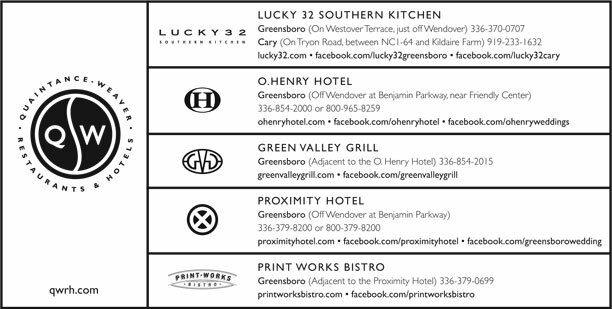 Read all of the past 70 features, and sign up for notifications for new ones at lucky32southernkitchen.com. Tuesday’s Live Music in Greensboro: Chef Jay Pierce’s skillet-fried chicken continues to be topped with live music by our very talented friends, 7–10 PM (no cover charge). See schedule of artists at lucky32.com. Date Night: From first dates to parents’ night out, tell us your favorite memory. Celebration: There are many occasions to celebrate! It’s the Little Things That Count: Share your story about a staff member who did something amazing. Email your story to lucky25@qwrh.com or mail to Quaintance-Weaver, 324 W. Wendover Ave, Suite 320, Greensboro, NC 27408, by July 31. We look forward to sharing some of your stories. This legendary dish on Lucky’s menu has been our most-requested recipe. Rinse black beans in cold water. Place in a colander and drain well (at least 10 minutes). Add beans, salsa, onions, bell peppers, cilantro, breadcrumbs, jalapeños and both Tabasco® sauces to a mixing bowl. Blend well with hands, mashing some of the beans to form a thick mixture. Form into 3-ounce patties and set aside. Using a food processor, blend tortilla chips, cumin and coriander until it has a crumb consistency. Dredge each bean patty in the tortilla mixture. Heat oil in large skillet and sauté bean cakes over medium-high heat, turning when they are golden brown. Visit printworksbistro.com, greenvalleygrill.com and lucky32.com for current seasonal menus, lots of recipes, the latest wine list and online reservations. We offer “call ahead seating” for those situations when you want to dine with us but do not have reservations, and you are concerned about waiting for your table. With larger parties, we offer pre-ordering to expedite service so you have more time to enjoy your visit. Let us know when you make a reservation if you would like to pre-order. Just fax us your orders by 10:30 AM at lunch and 4 PM at dinner, and we’ll have your meals served within minutes of arriving. Call the restaurant or click here for a pre-order form. Our restaurants and hotels offer gift certificates for purchase seven days a week on-site, or you can order online at qwrh.com. Customize a gift certificate for a hotel night stay (or even a variety of packages) for your fortunate recipient by calling the Proximity at 1-800-379-8200 or O.Henry at 1-800-965-8259.